Hey, everyone! I’m continuing to receive a lot of positive reactions to my first couple pieces here at MTGPrice, and I really appreciate it. I’m glad that my words have been able to help so many people, and I’m always willing to accept requests for upcoming articles if you have a general or specific question about Magic finance that you’d like me to address. While the titles to my last two articles were oddly food-related, I want to assure you that this week’s teaser does not have anything to do with different milk-fat percentages. 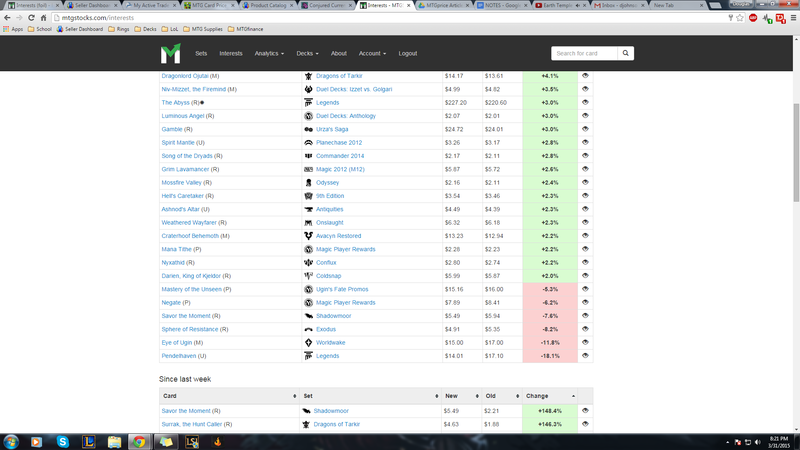 In fact, I’m talking about the Interests page on MTGstocks.com, and the Biggest Gainers/Losers page on MTGprice.com. These pages are two of the cleanest and most efficient ways for a single person to check what happened over the past 24 hours in MTG finance, at least in terms of single cards spiking or dropping in price. I highly recommend you bookmark one or both of these pages and reference them at least once a day. It will help you to be aware of what to value your cards at for FNM, when to update your inventory on TCGplayer or eBay, and what cards you need to put your cross hairs on for the purposes of your own trading and buying. While my last two articles focused on specific cards that I think you should get rid of or pick up, this one is going to attempt to teach how to spot those cards on your own, which I believe to be a much more valuable skill in the long run. One of the biggest mistakes that I used to indulge in back when I thought I was a hot-shot financier was using the recent price spikes to my advantage once they had already happened. While this would help me out in the short term while trading at FNM or occasionally finding unchanged listings on eBay or CardShark, I wasn’t finding a way to stay ahead of the game; in fact, I was lagging behind it and feeding off of the scraps of others. I would find a card that had changed in price by at least 99 percent (we’re sticking to that number so my subheading joke works), such as Tempered Steel, when it jumped because of that silly mono-white aggro deck back when it was in Standard. Wow, I feel really old talking about that, even though it was only a few years ago. Anyway, I would trade for them at their “old” price, and try to find stores that hadn’t updated their prices. Usually, this would result in me owning a card that had already spiked, and having no way to get rid of it. While I had technically gotten the card at its pre-spike price, I was on a short timer to dump it at the inflated number before the hype wore off. Although I have long since realized that this is ethically in a gray area and pretty inefficient nowadays, there are a lot of people who don’t recognize that. They check the “Biggest Gainers” and “Weekly Winners,” helped by the fact that the cards are sorted in such a fashion to show you the cards that already spiked. While this is helpful if you own the cards that are listed at the top of the page and want to know what cards to immediately try to sell out of, it doesn’t directly benefit you if you’re trying to find the next target days before it actually rises to the top of the page. I’m here to tell you that what you should be really looking for are the cards that consistently show up with a two percent, or similarly small percentage, next to their name, week after week. In the case of MTGstocks, two percent is the smallest price increase that justifies showing up on the daily Interests page, and it’s usually only an average jump by a number of pennies. No. Let’s not have that mentality. 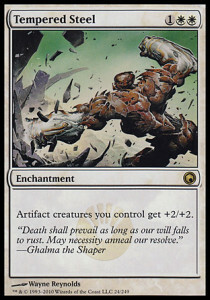 Instead, let’s take a look a card that I think actually portrays what I’m trying to talk about. Do you see it? Can you guess on what card I think is an excellent sleeper for this type of “two percent” creep? Fine, I’ll give you a hint. Alright, so it’s been slowly trending up from a low of $1.50, and it’s approaching $3.00 rather steadily. I’ve noticed that this guy has been towards the bottom of the daily Interests page, hovering between two and four percent at least a few times a week. I’ve also received at least 12 copies from my Pucatrades Want list, as you’ll be seeing on our Saturday article, “What We’re Buying and Selling This Week.” I say this for full transparency, as I believe that the card has real potential to spike to at least the $6 to $7 range. It sees a tiny amount of Modern play in that Eight Rack deck, it’s a casually appealing card in a synergistic archetype (in my experience, discard is somewhat close to mill in terms of casual appeal), and it’s legal in Tiny Leaders, for whatever that’s worth. 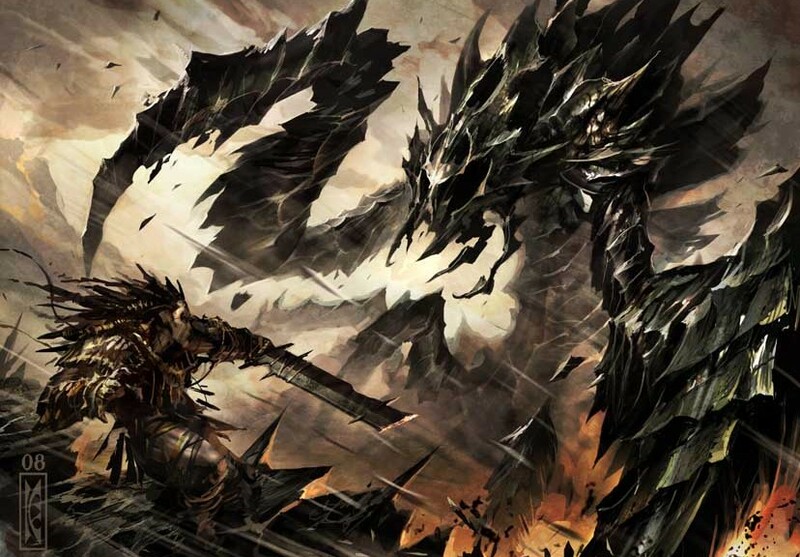 While it’s obviously not a format staple, it certainly appears to be powerful in the Varolz deck, where you can scavenge it into something evasive like Phyrexian Crusader and just kill your opponent before he or she can react. (I’m no Tiny Leaders expert, though, so I’d appreciate those that are chiming in and telling me if I’m an idiot for saying that.) Lastly, I’d like to put a cherry on top and mention that it’s never been put in any supplemental product ever. The only Nyxathids that exist are the ones that were cracked from Conflux packs around seven years ago. Is Nyxathid going to be the next four-of in a Modern pro tour maindeck? No, of course not. 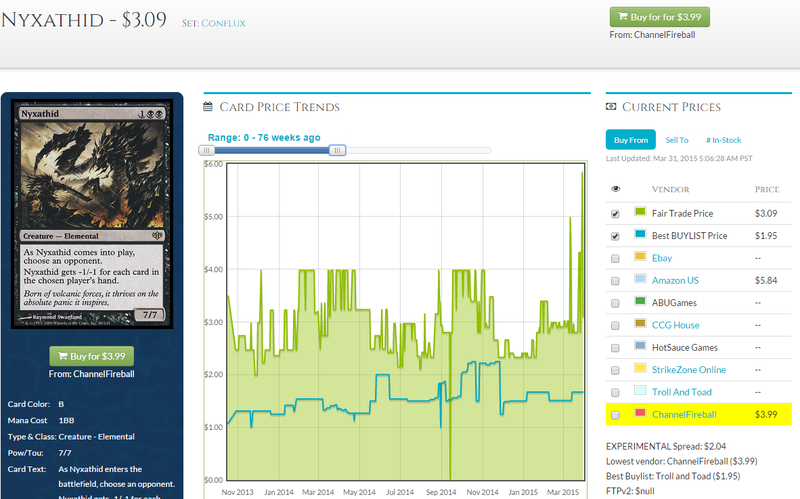 Even if it does spike, I don’t think it will stay at $10, and I don’t think foils should be $15 or $20. What you can do, though, is wait until that two percent creep reaches a breaking point, and keep an eye on the changes in supply on sites like TCGplayer, SCG, and eBay. Even if it spikes for a stupid reason, you can have copies in your hand to immediately make money off of, that you’ve been holding onto ever since you saw that card repeat itself on the bottom of the Interests page. 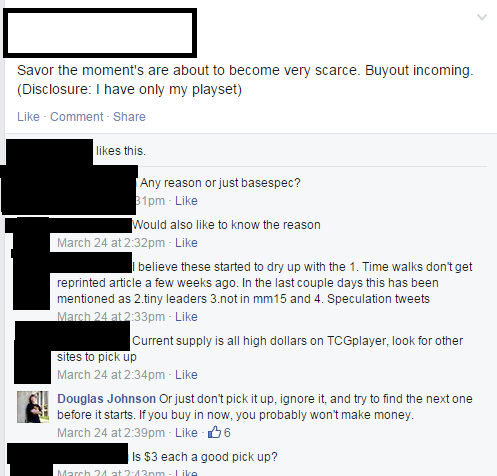 In my opinion, the best part about this type of speculation strategy is that you’re far ahead of the game. If for some reason the card suddenly spikes, you’ve already been keeping a pulse on the card for weeks, by making mental notes of the cards that appear repeatedly near the bottom of the two percent section of the Interests. You get to savor the moment while everyone else scrambles to do what I suggested that you don’t do in the first few paragraphs of this article. While everyone is buying copies during the spike and chasing the hype, you get the opportunity to casually sell into that hype and make your money before the dust even starts to settle. If you can sell copies of your spec while they’re climbing up to the people who think it’s going twice as high as they’re buying for during the hype, you’re golden. I’m certainly not blaming the person who posted this picture on Facebook for causing the spike. That’s not what I believe happened at all. I just want to use this recent example to show how you could have been in on this card at bulk rare pricing as early as this past December. Savor the Moment crept up, penny by penny, every few days. From $1.00 to $1.04, to $1.21… ever so slowly. These types of miniscule changes are tracked on the Interests page, and allow you to get in early before the card happens to skyrocket in price because someone decided to spend less than $100 on TCGplayer to force something to happen. Did you know that there’s an Interests page for foil cards on MTGstocks? I recently learned that there were a large number of people who didn’t know this; that’s probably because the only way I can figure out how to access it is to add on “foils” to the normal URL of mtgstocks.com/interests. In a world where we’re constantly hearing about X or Y card being bought out on TCGplayer, it’s important to know that there are ways of noticing tiny trends ahead of time, and jumping on them weeks in advance before anyone else catches wind of the card. Have you noticed anything that’s oddly similar to Nyxathid or Savor the Moment over the past few weeks? What do you think is the next two-percent spec? Let me know in the comments section below, or on Twitter, Facebook, Reddit, etc. You all know the drill by now. Thanks for reading! I love the Nyxathid call, but more importantly I appreciate your approach towards speculation. I often try to pay close attention to the bottom of the Interests list to find those slow-steady gainers. Great strategy and great rationale. 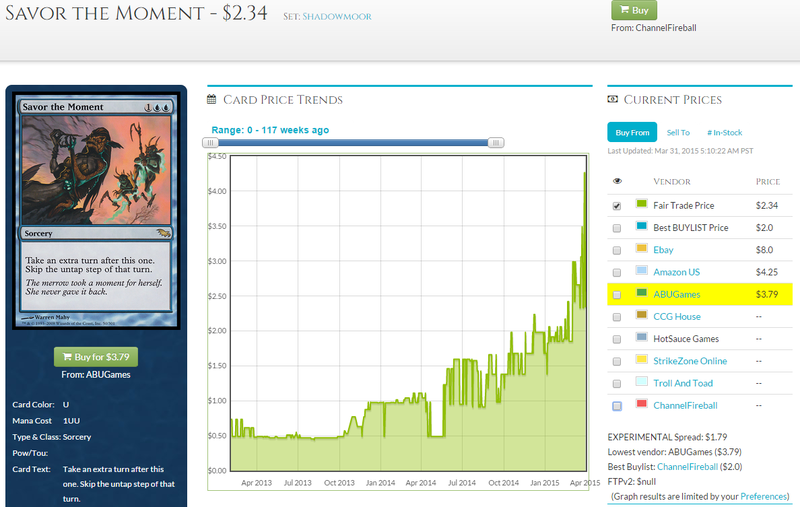 Next level – somehow tracking the <$2 cards creeping upward, since they haven't shown up on the Interests list yet. If we could do that, we could probably find a LOT of opportunities with low costs of entry. Hmmmm…. Thanks! I appreciate the kind words from someone who has been a huge inspiration for the past several years. I hear you on bulk rares that are slowly creeping up; Its’ hard to weed out everything in that price range and separate the random chance movers from the ones that show repeated upward trends with actual reason. We can certainly build tools like that. Perhaps a “micro interests” page as well as a regular one. Ooooh micro-interests could be neat! Maybe force the required gain to be much higher for such a page – like 25% minimum gain or something? foil multiplier might end up being weird for Nyxathid since its from Alara block. Didn’t know until last week that they sold all foil Alara block packs (I wasn’t playing then). I’m not sure if it included all alara cards or just some. Someone who knows better might be able to explain.